Just a very small blog this time. To save time, I just reused the title of the relevant Microsoft article. 🙂 Sorry about this. But this blog is about external sharing in SharePoint and OneDrive. Last Ignite (September 2017) Microsoft announced some improvements here. And these have rolled out to 1st release tenants. And it works great! 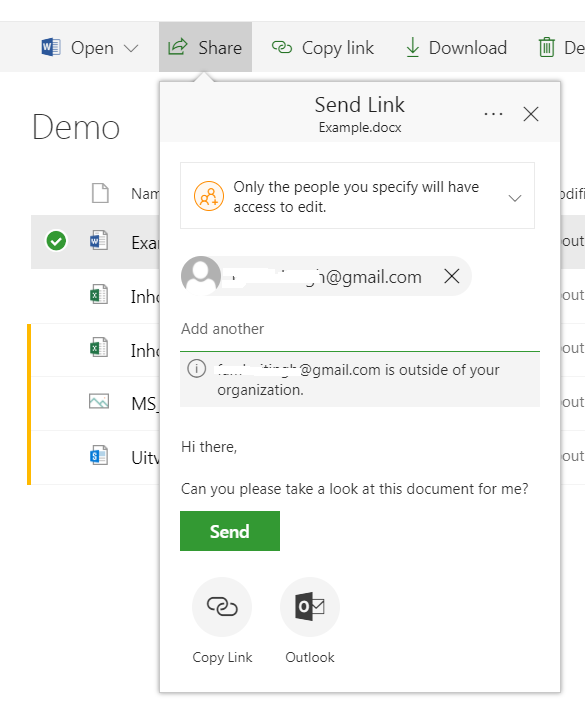 Previously, you could share content from SharePoint or OneDrive with external contacts only if these contacts had a Microsoft account. This is going to change. From now, you can share your content (if enabled) with anyone outside of the organisation. Now, when sending secure links to recipients outside of your organization, those recipients will be sent an email message with a time-limited, single-use verification code when they open the link. By entering the verification code, the user proves ownership of the email account to which the secure link was sent. Well, this seems easy enough. Let’s try it out. From a SharePoint Online library, I am sharing a document with an external contact. This contact has a Gmail-account. This contact receives a notification. Basically the same as before. But the magic happens when this contact opens the link to the document. Now Office 365 will challenge the contact to enter the confirmation code, send to the same e-mail address. When this code is correct, the document will open. Cool stuff!